It's the second Saturday of the month which means that it's my Design Team Spotlight over at Kitty Bee Designs. 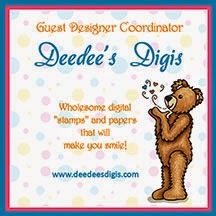 I love doing the DT Spotlight because it gives me a chance to use a Kitty Bee Designs image. There's always a problem though.....I want to use them ALL! They are all so cute!!! This month I decided to use one of the cow images... "For You Cow Bee". I'm not sure but I've really been liking cow images lately...go figure. Stop over and visit Kitty Bee Designs - we have challenges every other Friday called Aloha Friday Challenges where we have great sponsors and you have a chance to win the prize offered for that challenge. And of course there is the Design Team Spotlights where you get to know the DT a bit better and see the Kitty Bee Design images in action. And of course - visit the Kitty Bee Designs Etsy shop and see what great images are there! But beware....you'll probably be like me and want them all! Thanks for stopping by today - God bless you!!!! Hi Zella! I thank you so much for sharing this sweet card with us. It's always SO nice having you stop by to play along and to share your talents. I hope that Mom is getting stronger and healthier every day. I continue to pray, and really encourage you to let her know EVERY DAY how very much you love her! We never know how many days we have left to share with our parents, so never pass up a moment to say I LOVE YOU! Thank you so much for joining our "anything goes" challenge at Word Art Wednesday. We appreciate your support and your wonderful inspirational creation. Hope you will join us next week too. This is so cute! Love the image and dp. Hi Zella, what a sweet card. The cow is so fun and the colourcombination great. Love also the square button, great. I really like cow cards. What is it about cows, anyway? I even like seeing them in the fields! I think pink & brown are a great color combination. I really like the layered ribbons, too. Thanks for joining us at Shopping Our Stash! WHat a cute FUN card! I love the colors! Thank you for joining us at Creative Corner Challenges! Oh this is CUTENESS personified!! Smiles. How cute is this! Love the image and love that square button! Thanks for joining our button challenge at Creative Corner Challenge this week and hope to see you again!